Full-time RVer Profile in Escapees Magazine! Full-time RVer Profile in Escapees! Last spring we met a special couple, Phil and Ann Botnick, who have been living in an RV full-time for twenty-six years. As we got to know them, I was so taken by their story (and their rig — it is amazing! ), that I wrote an article about them for Escapees Magazine. It is appearing in the September/October 2014 issue. Phil and Ann started full-timing as young working adults in their late 30’s and early 40’s, and they have been creating a life and making a living as RVers for nearly three decades since. 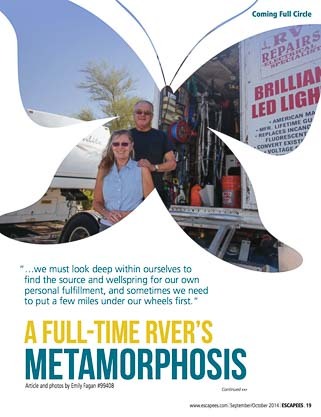 I found their story inspiring because they have continually tweaked and adjusted the way they live the full-time RV lifestyle as the years have gone by, honing their daily activities to best reflect their interests and needs. Full-timing sounds so great (and it is!). However, before most “future” full-timers start rolling down the highway, their focus is (necessarily) on the downsizing and leave-taking aspects of this huge life change, rather than on the life ahead. While caught up in the workaday world, and figuring out how to launch your full-time RV lifestyle, the image of yourself in your new life may be quite static. You’ve left the real world behind and you’re out there doing it. What more is there? “We’ll be seeing the country!” was all I could muster in my vision of ourselves living on the road before we started. Simply breaking free was our primary goal. We had no plans beyond the first two months. Yet we have changed our traveling lifestyle in major ways since we started traveling full-time in 2007, trying different rigs, different styles of camping, perfecting our individual roles and pink versus blue activities, splitting our time between our RV and a sailboat for a while, and then returning to RVing full-time. We discovered we enjoy sharing tips and glimpses of this lifestyle, and found a passion for writing and photography that we were never able to indulge before we moved into our trailer. Most important of all, we pinch ourselves everyday that we get to live this way. We are continually fine-tuning our lifestyle, and it keeps getting better and better. As I listened to Phil and Ann telling their story of why they decided to move into an RV, and what their Grand Plan had been at the time, I heard echoes of our own story and those of other full-timers. It is reassuring, when meeting folks who have been living this way for many years or even decades, to learn that they went through the same learning curves, made similar mistakes, sampled many different ways of living on the road in an RV, and eventually emerged triumphant with a lifestyle that is uniquely their own and is extremely satisfying. Escapees RV Club is unusual among RV clubs because it is focused largely on the long-term and full-time RV lifestyles. Besides their truly outstanding magazine, they offer a huge variety of services to RVers, from mail forwarding and establishing a legal domicile to a network of RV parks to an informative online RV forum to bootcamp instructional programs for new RVers to a program for the most elderly among us who still wish to continue living in our RVs — with assistance. If you mention our website, Roads Less Traveled, when you join, they kindly put a little something in our tip jar. To see a snippet of their magazine and read my article, I have been given permission to share it HERE.